I recently crossed off another restaurant on my "to-eat" spreadsheet, one that'd been on there almost since the beginning. 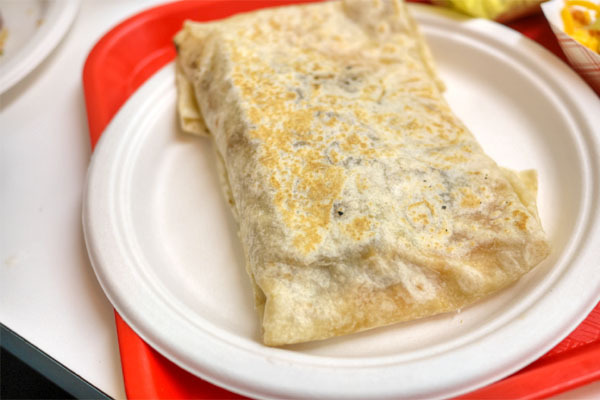 I'd been curious about Arturo's and its puffy tacos for years, but its somewhat out-of-the-way location had kept me away until now. 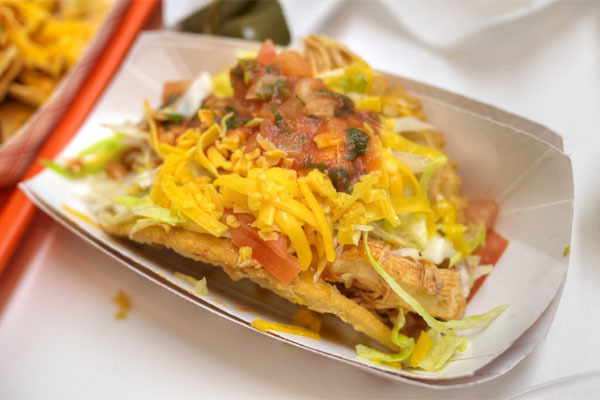 Some background: Puffy tacos are like regular Tex-Mex-style hard shell tacos, but with the standard tortilla replaced with a wrapper of deep-fried masa dough. It's unclear when and where they were invented. 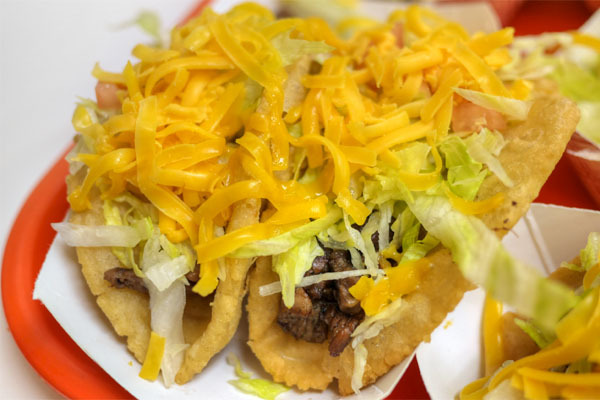 One popular story states that they first became popular in 1978, when Henry Lopez opened Henry's Puffy Tacos in San Antonio; Henry's old brother Arturo subsequently opened Arturo's Puffy Taco in Whittier (as well as La Habra--that location has since closed) soon afterward. 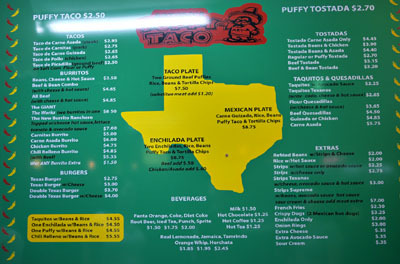 On the other hand, another version of the tale mentions that the puffy taco was actually born in SoCal, with Arturo bringing the creation back to his family in Texas; in addition to Henry's, the tacos are also installed at Ray's Drive Inn, which was opened in 1956 by Henry and Arturo's father Ray but only started serving the tacos a decade or so later. 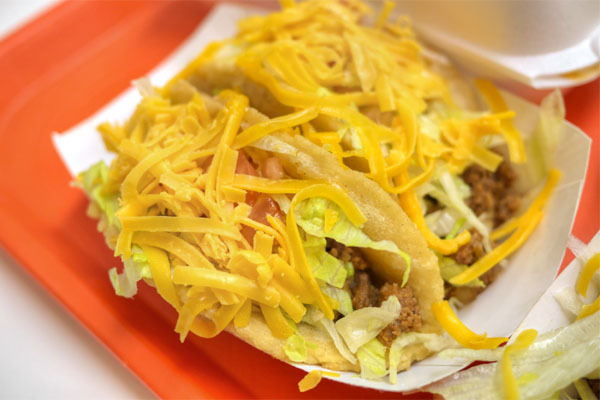 Or, Ray actually came up with the taco and passed it on to his sons. There are conflicting stories everywhere. You order outside, but food is delivered through the window pictured above. Seating is both indoors and out. 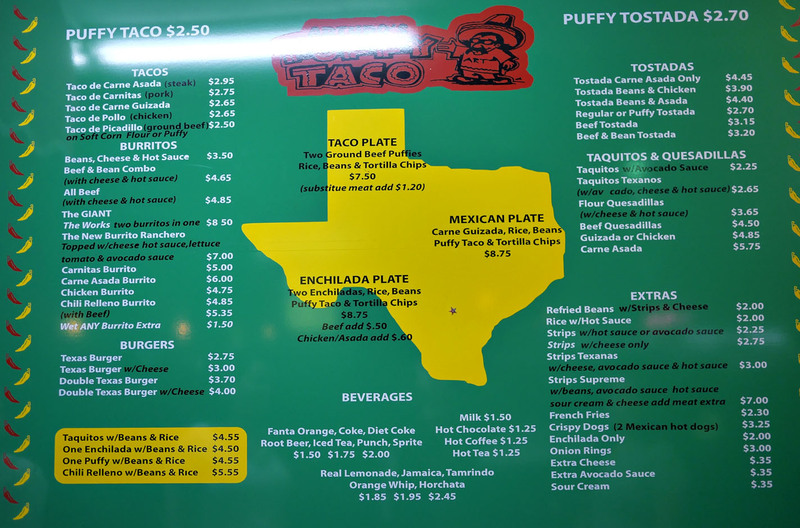 As for Arturo's' menu, the puffy tacos are obviously the main draw, but you also get your usual Mexican-American fast food fare, plus burgers. Click for a larger version. 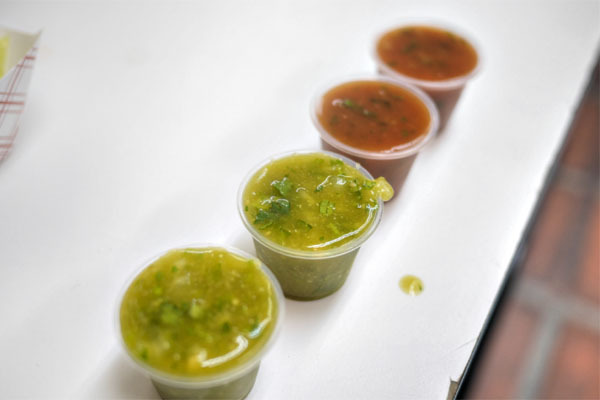 Two types of salsa were on offer: a prototypical rojo and a brighter, spicier verde. Naturally, we had to start with the signature item here, and it did not disappoint. The filling of ground meat came out smartly-spiced, its straightforward, satisfying savoriness well-matched to the classic combination of lettuce, tomato, and bright yellow cheese. 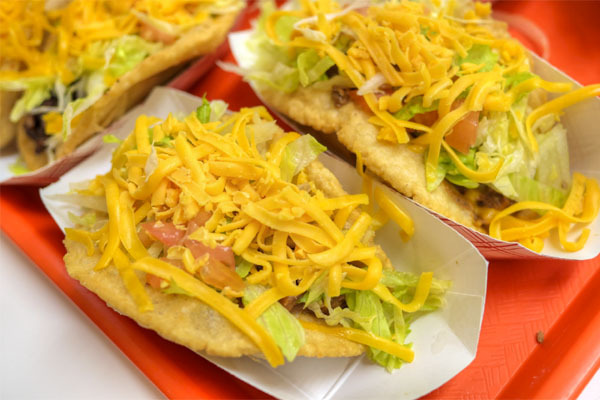 The crux of the dish, though, was that puffy shell of course, which was simultaneously crisp, fluffy, airy, and substantial, a wonderful commingling of textures that also imparted its own deep-fried relish to the taco. 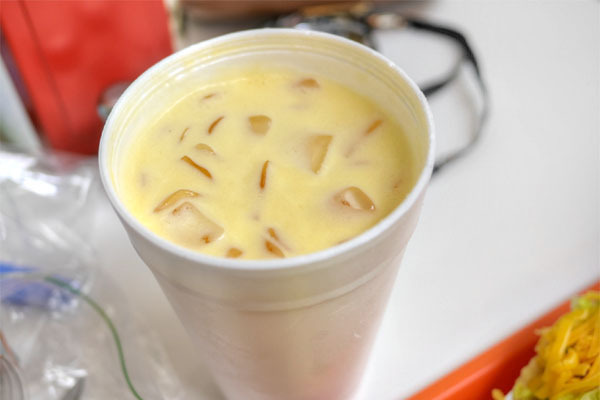 In addition to all the food, we also ordered a large cup of Orange Juicy Whip [$2.45], which, from what I can tell, is basically identical to Orange Bang (not having had Orange Bang before). The taste? Think liquid Orange Creamsicle--not bad. 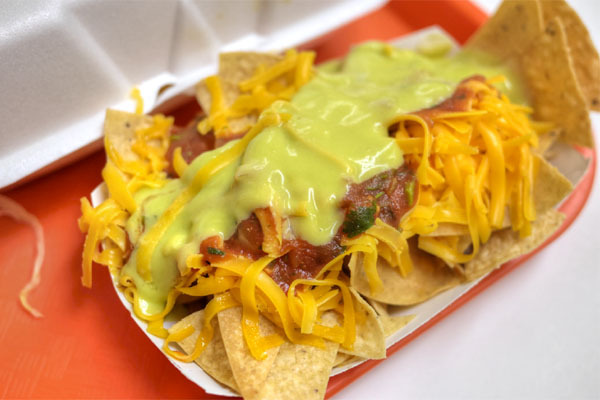 Nachos, curiously, are called "strips" here, and the Texanas preparation was particularly trashy. The asada also made for a great filling, the meat arriving surprisingly tender, with a nice char to it. 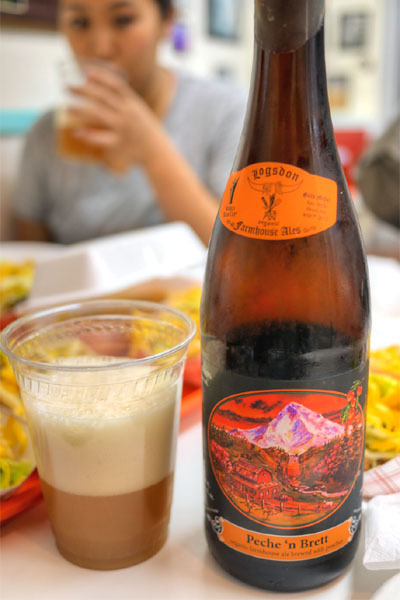 Tacos call for beer of course, so we BYOB'd it and got things going with the oft-hyped 2015 Logsdon Peche 'n Brett, an oak-aged saison refermented with peaches as well as pear juice. I'd had this almost exactly a year ago at Superba Food + Bread, but preferred tonight's bottle. There was such a depth from the peach here that really appealed to me, a fruitiness and a sweetness, but all countered by a dry, Brett-y character and subtle bitterness. Superb. 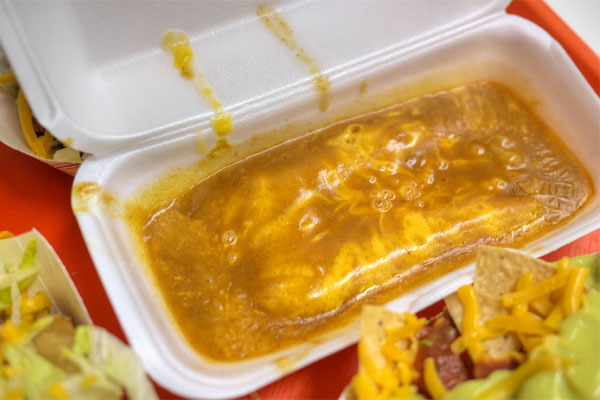 Enchiladas, meanwhile, were super gooey, monolithic masses of cheese and tortilla that were so, so heavy. The long-stewed guisada might've been my favorite filling, with its supple consistency and deeply-developed flavors. 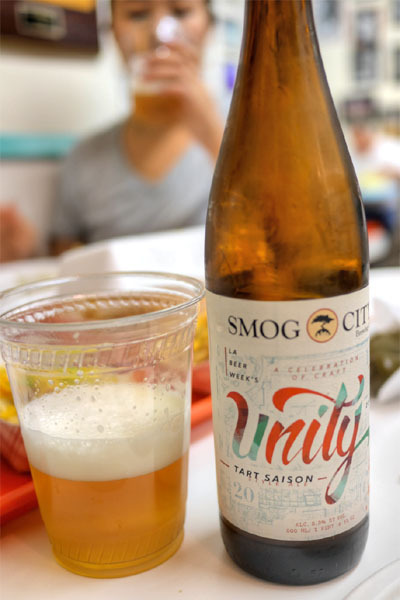 Next was the just-released 2015 Smog City Unity, a tart saison created in collaboration with the LA Brewers Guild to celebrate LA Beer Week 7. I quite liked this one as well, a bright, refreshing beer with its expectedly tart notes joined by contrasting hits of spice, grain, sweet fruit, and yeast. 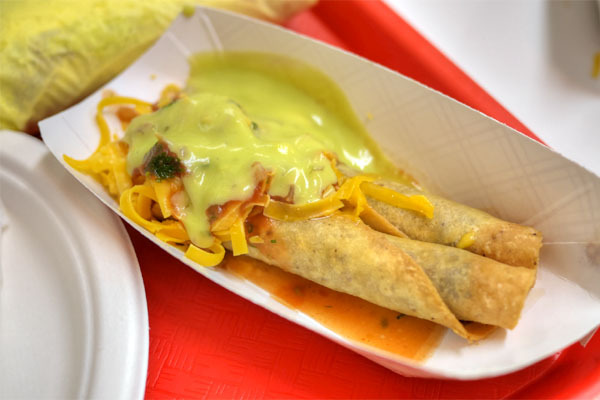 Taquitos were textbook, crispy examples that made sense with the trio of accoutrements up top. The chicken was surprisingly hefty, with the large chunks of the bird perhaps not working as well as some of the other meats here. 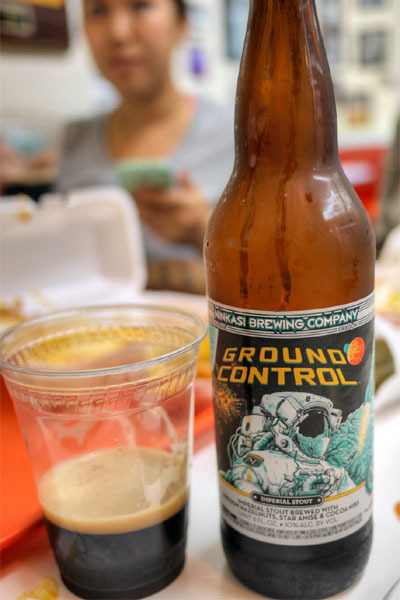 We concluded with the 2015 Ninkasi Ground Control, an imperial stout brewed with Oregon hazelnuts, star anise, cocoa nibs, and yeast that was actually sent to space and back. I'm not sure if said space yeast did much for the beer, but it was tasty enough, with your classic roasty, malty nuances accented by a general overarching layer of sweet spice. 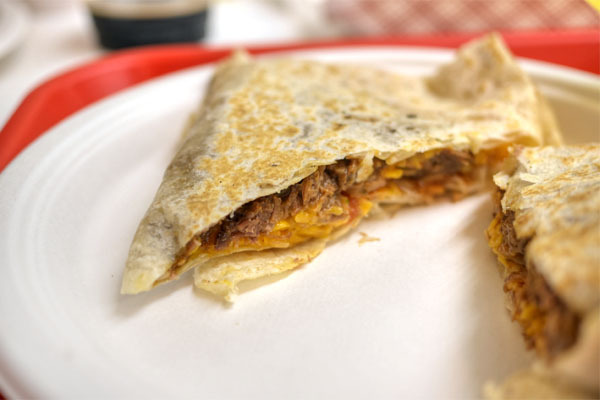 The quesadilla was brick-like in appearance, an amalgam of meat, cheese, and tortilla that recalled the microwaveable chimichangas of my childhood (and I mean that in a good way). 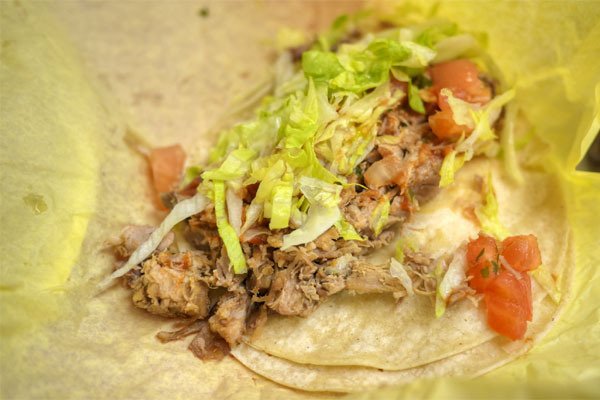 Given all the puffiness, we opted for a standard soft corn tortilla in our final taco. It worked well enough, but couldn't hold a candle to the puffy. I was finally able to try the O.G. puffy taco after all these years, and it did not let me down, a culinary mash-up that exemplifies the best of Tex-Mex cookery. Y'all need to get on this if you haven't already. I can't believe this clown is reviewing this quality beer in plastic glasses. Cero credibility. I think this year's PnB had to have been brewed with some amount of artificial flavoring because the Peach is SO much more present than in years past. I liked it, but it was a bit unbalanced for my palate.